Both city residents and visitors alike now have an extra choice in how to move around the center from the start of this month. 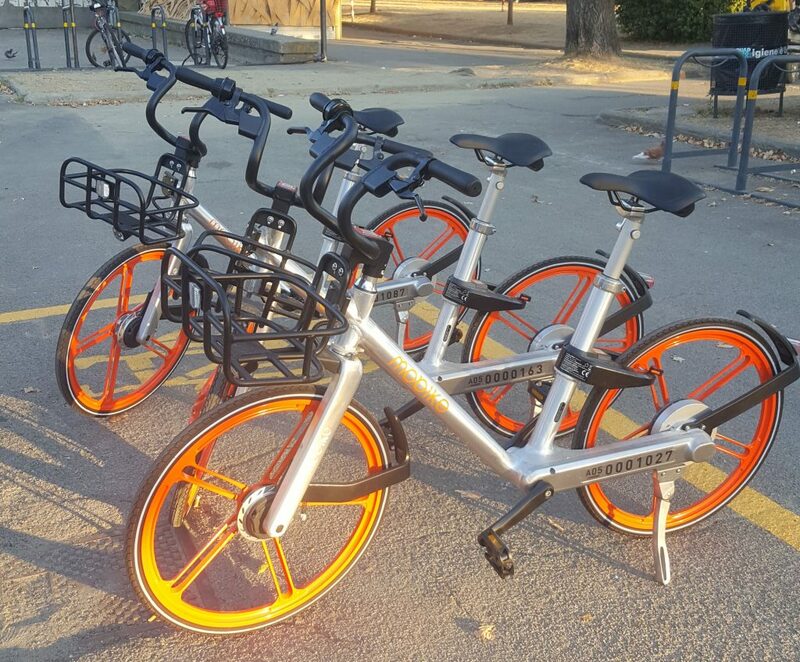 Florence has become the first Italian city where Mobike, a large Chinese company operating in the sector, has debuted its “free flow” bike sharing program. What does this mean? It means that the first 500 bikes now moving around Florence can be found through a dedicated APP that shows you where they are on a map and you can rent them out at any time of the day without needing to head to specific location during specific open hours. The bikes are easy to identify with their bright orange rimmed wheels, black basket and saddle. Special “parking” areas have been painted across town where users can leave the bikes — for now, there are 50 such areas and should increase to become 130 over the next few weeks. We’ll see how easy they are to “use” if no one else parks on them. But by its very nature, this “free flow” bike sharing service does not need the traditional bike parking areas. Users are encouraged to leave them near general bike racks (without tying/locking them to the racks, of course). Bike users should not park them on sidewalks or other areas where bikes are not permitted! The city has picked out areas for the bike sharing program to make it easier for everyone to use although you aren’t required to use them. More bikes will be added through the next weeks to arrive to 4,000 total bikes by October. All you need to do is download the free Mobike APP on your smart phone from either the Apple Store or Google Play. You then create an account using your cellphone number – you’ll receive a confirmation code you use along with a credit or debit card (to be used as a partial security deposit for any damage you might cause the bike during your use). The APP has a map showing where the closest bikes to you are located. You can then reserve a bike for up to 15 minutes by clicking on the bike on the map and clicking on “reserve”. Once you find the bike, you click on “Unlock” on the app and scan the QR code located between the handle bars with your phone… and the bike unlocks so that you can start using the bike! UPDATE OCTOBER 1: I got a comment below about not being able to use the mobike app with a non-Italian number so I contacted Mobike to ask about this… I got a reply today saying it is true, for now the service is tied to Italian mobile numbers but are working to make it possible to use international mobile numbers with the app. So stay tuned! Once you get to your destination, try to park in one of the dedicated areas or in any bike rack (again, not on sidewalks!) and use the lever on the bike lock to end your rental. The APP will automatically end the rental time for your bike, and you’ll be charged only for the time you used the bike. The bikes are already spread out and available to use all over Florence. During this initial period, there are promotional tariffs to encourage everyone to try out and start using the new rental bikes! The base cost will be 30 cents for every 30 minutes (which will increase to 50 cents). The deposit for now is just 1 euro but will increase to 50 euros once the bike sharing comes to its full regime. Info on cost is found within the app as well as on the bikes. There are subscriptions for monthly, trimester, semester and annual use so these bikes should be great for residents and students who don’t want to take on the full cost or worry about owning a bike in Florence. 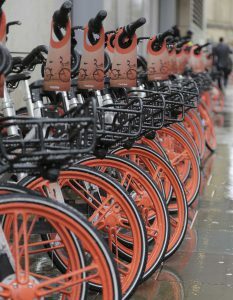 The more you use the bike and in the correct manner, the more you’ll benefit: Mobike plans to offer discounts and offers to those who use the bikes well. Those who don’t will be “punished” and can have their subscription cancelled. 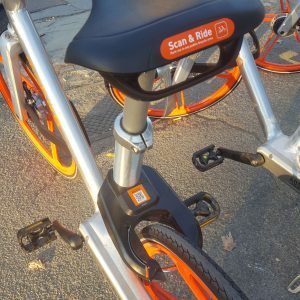 Mobike has created bikes that will not be easily stolen (a wide problem in Florence): the smart bikes have components that cannot be used on other bikes, each bike is traced with GPS and has a loud alarm that rings out when the bike is moved with the lock still activated. It also has some components, such as the brakes, that don’t work if the bike is not activated through Mobike’s App procedure. Users can also use the App to signal damage or trouble with the bikes. We’re looking forward to trying them out soon! If you’ve used them already, let us know about your experience and whether they were easy to use. In the meantime… happy travels on two wheels on the streets of Florence! While in the rest of Europe cyclists can use one way lanes in the opposite direction, Italy has decided to “protect the safety” of cyclists and pedestrians by not allowing this. So follow street signs and, in downtown, pay attention to the direction in which cars are going or parked to determine the direction of the street: the majority of tiny streets downtown are in fact one way. Also, when crossing main streets through a crosswalk, get down and walk across the street. Unless there are clear broken lines that are in parallel to a crosswalk, you cannot ride across the crosswalk. Fines for riding a bike in the wrong direction are as high as 41 euros and Florence’s city hall has communicated that there won’t be any excuses. If you’re caught in the act, it is likely you will receive a fine. My solution? Get down from the bike and walk it for a short block to get back into the flow of traffic! UPDATE Sept. 20, 2017: We’ve used the bikes! Using the APP: The app was easily downloaded, just be prepared to enter credit card details right away to be able to use it. Right now, the deposit is 1 euro and then to use the bike you need to “top-up” the account as the balance pays for use. The lowest you can top off is 5 euro — most importantly, you can request a refund for any balance not used and for the deposit once you’re done using the service. This is important for temporary visitors to Florence to know: rest assured you can get funds back for using these bikes while in Florence! The APP is easy to use, with the map loading as you open the APP to find the nearest bike and then the “unlock” button on the home page let’s you quickly scan and unlock the bike to start using it. Easy peasy! Using the bikes: Now, here is where I have to start criticizing two aspects that impacts on the ease of actually using the bikes. First, the bikes are heavy… and there are NO GEARS!! The bike basket in front also feels awkward (see how it is shaped in photos above) so the first time you get on, be prepared to go down a few meters down the street wobbling right and left as you get a feel of the bike. The handlebars seem hard to maneuver at first, I’m blaming the basket. I have a bike and ride often so I’m not an inexperienced cyclist. The hardest part to using theses bikes was getting used to having no gears. Be prepared to go slow and for getting a leg work out! My thighs were sore the day after, but I did do a total of 8km into downtown and back to the office. Recommend them: YES! Considering the center is small, I would recommend the use of these bikes within the historical center. The center is relatively flat so the weight of the bikes won’t be felt (unless you cross some bridges which are not exactly flat) and since you’re on vacation and not in a special hurry, you can go slow and enjoy the ride. It is really cheap to hire these bikes: I spent a total of € 0,30 for the ride there and back plus had the convenience of leaving the first bike in one square and picking up the return bike in another square. Perfect for when you are sightseeing and end up in a different place than where you started. No need to backtrack. I would recommend it for anyone also staying outside the boulevards that surround the center as a quick way to get downtown, leaving the bike once you’re in a central location and then dedicating your time to sightseeing and just walking around then. Have you tried these bikes yet? What did you think? I want to use the app, but it is impossible for me because i can not choose my Dutch phone number. Any solutions for this problem? Oh NO! I didn’t realize they had set some sort of control on the phone numbers. That is not too smart of them … I will send a message to mobike and ask. Are you in Florence for long? Except for the ridiculous size of the bike and the fact that the saddle doesn’t stay at the hight you set it, it works fine. But you have to be a child or a midget to be able to ride it comfortably. When my knees are at the point where I start pushing down they have a 90 degree angle, very tiring to bicycle then. Don’t try to stand up and bicycle because the bike is really badly balanced. I’ve been bicycling for more than 50 years in all kind of terrain. Otherwise it’s great. It looks good. It funktions well if you are small!! Signing up, finding a bike, unlocking etc works like a charm. I agree with your comments about their use. I’ve used them several times now and my biggest complaint is the saddle not staying put. At 5’6” I am not that tall and the saddle at its highest would work out fine, theoretically. But as you go, the saddle does not stay put, as you’ve said. I hope they get that fixed! It is also very heavy, I wonder if it is to prevent easy thefts but if they really want people, particularly locals, to use them more, that is something they need to work on, fully agree! I believe so, it was something they were supposed to implement right away and as the bike sharing has expanded I would think it was an option added for sure!